Big thank you to Jim (Manager at Texas Mist) for working to get us permission to have our monthly meeting again at Texas Mist. It was a good meeting too. We talked about the various benefits that have been held to raise assist the families of those arrested in Waco, and because of those benefits, a bunch of people have been helped to pay bills and other expenses. We were also cautioned that before donating to any of the fund raisers that are popping up, we need to make sure they are legitimate. 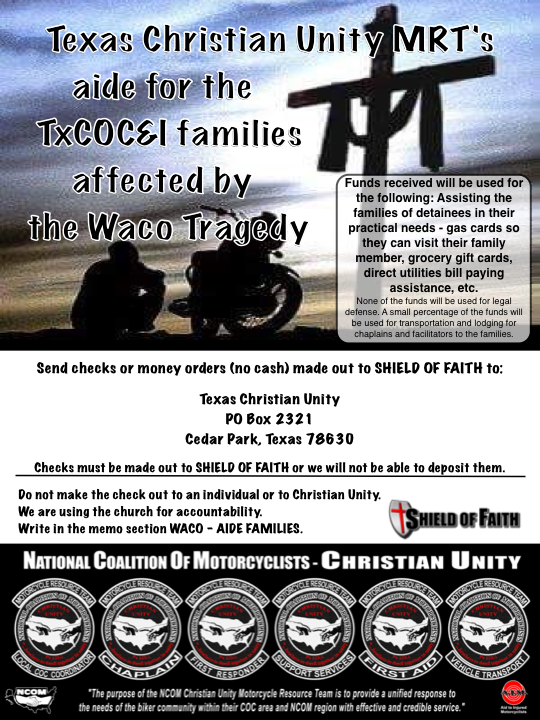 This is just a reminder that the June UCOA meeting is at our usual location Texas Mist tonight. And, while I was posting this reminder I thought I would re-post a few of my favorite photos from the COC&I pre-legislative day meeting in January. These photos show how motorcycle riders work together whether they are in clubs or not in clubs. Enjoy! Look Debbie, I found some jewelry ! !